John DeCaro at All Ocean Yachts tells me that there's been another smallish drop in the price of Inace's 33.83m motor explorer yacht Sudami. Built in 2007 to ABS class and MCA compliant, she sleeps up to 12 guests in a master, two doubles and two twins plus two Pullman berths. 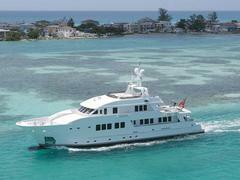 Sudami's most recent price cut saw her at $8.845 million and she's now asking $8.795 million.